I suggest to cook with fresh or dried herbs and spices as often as possible in order for you to obtain all the nutrients that your body needs to remain healthy. This post, an excerpt from my latest book, “Surviving Cancer”, explains why. Recent studies have associated consuming spiced foods for 1 or 2 days a week with lower risk of death, as well as a lower risk of diseases such as cancer, compared to not eating them. Why do spices help? Some investigators have suggested that fresh spices make available important nutrients such as vitamins A, K, and B6. In addition, spices such as turmeric, ginger, capsaicin, and anethole (anise camphor) have been credited with anticancer properties. Many other herbs and spices are being looked at as adjuvants (helpers) capable of ameliorating symptoms associated with cancer. Note that some spices must be paired with others to be effective for the body. For instance, curcumin from turmeric may not be absorbed insignificant amounts unless it is paired with ginger or pepper. In addition, spices can be helpful to regulate your food intake if the same types and similar amounts of spices are used during the preparation of a specific dish. By reinforcing the enjoyment of eating a particular food, over time spices may act as signal-amplifying agents for your brain to create the sense of satisfaction that leads you to stop eating when the intensity of the taste noticeably subsides. Th is helps you avoid overeating. 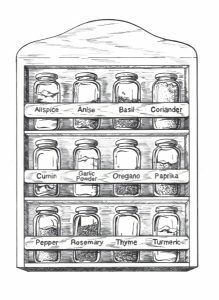 I would recommend trying to get your fill of micronutrients from fresh herbs and spices rather than in pill or liquid form as supplements. These supplements may not help because they sometimes do not contain sufficient quantities of the product, or they contain ingredients not listed on the label, or they contain much more of a nutrient than needed. And an extract cannot simply be a stand-in because a purified extract may have different effects than the whole herb. All spices are “spicy.” Many spices simply add a different flavor, without making it “hot” in the mouth. They do not make your tongue tingle or your mouth feel on fire. Their role is simply to add to the delicious flavor of the food in a pleasant way, or to add appealing color. You may have heard that certain spices can fight cancer. There may be some truth to this, but no one knows for sure. But there is good reason to eat spices. Watch! Spices contain many micro-nutrients your body needs. The foods humans eat contain both macronutrients and micronutrients. Our hunter-gatherer ancestors may have had to travel to many different areas to obtain food, especially micronutrients. They may also have been compelled to eat more foods containing macronutrients such as carbohydrates, protein, and fats just to get enough of the needed micronutrients. The need for micronutrients can lead to a circular problem of eating too much food. For example, when you eat an energy-containing food such as grits to obtain the micronutrient niacin, your body has to handle the other nutrients in grits. This means the body will be seeking more micronutrients to metabolize the extra carbohydrate the body absorbs from the grits. Your brain, in turn, may prod you to eat even more. One way to get around this vicious cycle is by finding an alternate source for micronutrients. One of the best sources of these is natural spices and herbs that come from different parts of plants. This may be why the use of spices and herbs in cooking started as far back as at least 2000 BCE, as early humans may have realized that spices not only made food taste better, but that they could eat less food and still obtain their energy needs. Spices have also long been used to preserve food for long periods of time. 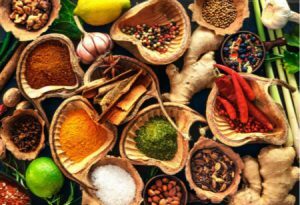 While our ancestors did not understand the reason, the antimicrobial properties make spices a useful food ingredient, especially in warmer climates, where infectious diseases can be spread through meat, which is particularly susceptible to spoiling. However, this doesn’t explain the extensive use of spices in a country like India, where much of the population is vegetarian, or their use in Mediterranean cultures that use a lot of fresh seafood. My explanation for mankind’s use of spices in cooking comes back to the brain’s regulatory mechanism. I suggest that spices are used to make meals more enjoyable because, in the brain, this enjoyment signifies the arrival of a needed micronutrient in the mouth. The evidence for this lies in the fact that spices and herbs contain abundant vitamins, minerals, and antioxidants in significant portions that make them ideal sources of micronutrients. In fact, herbs and spices can be the source of at least 25% of the 118+ nutrients that scientists have so far identified as necessary for the body. The World Cancer Research Foundation 2007 report estimated that 35% of the cancer incidence worldwide could be attributable to lifestyle factors, including food. A diet protective against cancer would include spices. For example, the United States was found to have much higher rates of colorectal cancer compared to that cancer’s incidence in India. The high consumption of spices is thought to be one of the contributing factors in the lower number of colon cancer cases reported in India. Humans have been using spices for well over 5,000 years. The potential of their beneficial effect on prevention and treatment of cancer has been investigated over the last several decades. Using rodents in experimental settings has shown encouraging results. Yet, in spite of over 100 clinical trials with spices and their components in human subjects, we still need confirmatory evidence to clearly understand their beneficial effect in surviving cancer.